Your Boxer is likely to be part of your family for 10-15 years. It's important that you are sure that this is the breed for you. A well bred Boxer is an entertaining companion, loyal protector, athletic working dog, and enthusiastic but gentle playmate. I think it is important to remember the origins of the breed - the Boxer needed to be both a guard dog and family pet. The Breed standard in New Zealand sums it up well: "The most important characteristics of the Boxer are his alertness and self-confidence. However, he is also a playful dog, although gentle and patient with children. He is fiercely loyal, intelligent and easily disciplined; he is cautious with strangers but responds quickly to friendly invitations. 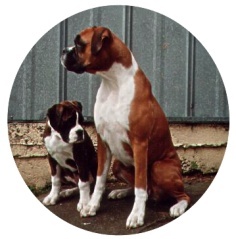 These qualities make the Boxer a well-loved family guardian and pet." For a good comprehensive description of the breed visit the The Dog Owner's Guide to the Boxer. Keep in mind that this American site uses the term 'fawn' where we would say 'red', and refers to cropped ears (illegal in NZ). Is a Boxer going to suit your lifestyle? Often people have misconceptions about the needs of a particular breed of dog. I've heard a few people saying that you HAVE to have a big section to own a Boxer. In my opinion where you live shouldn't matter to a Boxer. I know of people who have very happy Boxers in apartments. Boxers are very family oriented. They need to be included in family life. If you give a Boxer enough attention - ie let it spend plenty of time around your family and give it adequate exercise then whether you have a big section won't matter. There's another common misconception about Boxers - that they need heaps of exercise or they'll destroy a house. In fact the dogs that I've seen who got destructive have been given insufficient attention, but plenty of exercise! A Boxer is not going to be happy being left to run around a yard on their own (or with other dogs) - they need time with people. This doesn't mean you have to be home all day - you can work full-time and still have enough time for Boxers. If they're inside the house with you while you're home, if you give them a walk or run every day, if you take them with you when you go shopping, if you throw their toy for them and give them lots of pats while you watch TV, talk to them while you cook, whatever. It's the quality of the time you spend with your dog not just the quantity. Are all Boxers the same? The Web sites I provided above give some very accurate descriptions of the personality traits of a boxer. Don't let that make you think all Boxers have the same personality types. While all well bred and raised Boxers should be playful, good with children, and natural guard dogs, Boxer's characters of course vary. Some tend towards being very energetic, full of fun, a bit naughty, and hugely entertaining. Others can be gentler, easier to train, less entertaining but more affectionate. Keep this in mind when choosing a pup to suit your family. 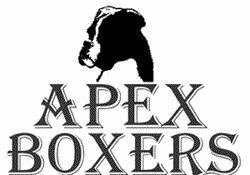 If the Boxer sounds like the dog for you, remember that there are significant variations within the breed. This is true of any dog - purebred or not! There are many very good lines with healthy dogs with excellent temperaments, but unfortunately some lines with timid or aggressive dogs and those with hereditary health problems. (I've provided some links and information about health on my Choosing a pup page). Boxers are wonderful dogs, but choose your pup carefully, ask lots of questions of any potential breeder. Make sure the pup you take into your family is right for you.